Executive Summary: This is the story of a planet of women, the Sharers of Shora, and what happens when they come back into contact with a patriarchal society after thousands of years of isolation. Shora, a completely ocean-covered planet, is in a binary system with Valedon, a “normal” world; the latter is one of the ninety-odd members of a galactic order decimated by a long-ago calamity, which has led the remnants of humanity to adopt strict prohibitions on certain types of technology, notably nuclear power. The million inhabitants of Shora have only recently been “rediscovered” by Valedon, and have escaped notice of this remnant government, but the situation is not going to last: the representative of the Patriarch (did I mention that the ruler of the galactic order is literally called "The Patriarch"?) is due to visit, and thanks to increasing trade between the two planets, he’s finally putting Shora on his agenda. We get a couple of interesting snapshots of Valedon’s caste-based society, and its internal conflicts and interactions with the galactic patriarchy. However, most of the book’s narrative and effort is expended on fleshing out Shora itself. Plotwise, this is a book of two halves. The first is a slow build introducing the characters, their worlds, and the conflicts between them: Sharers Merwen and her daughter Lystra; a Valan called Berenice who is part of the first family to re-establish contact with Shora; and a Valan boy called Spinel, who undertakes an “apprenticeship” with Merwen and becomes the lens through which we learn about more alien aspects of Sharer culture. Inevitably, despite Berenice’s best efforts, Valedon ends up sending a military force to subdue Shora, headed by her fiance Realgar, and the second half deals with the fallout from and resistance to this occupation, and its ultimate effects on both societies. Feminist Future: The Sharers’ entire existence relies on immense knowledge of and adaptation to the ocean world around them, but the “men = technology, women = nature” stereotype is undermined by their reliance on advanced biological engineering to maintain their existence. The Sharers themselves are a product of this engineering: they are hairless, with webbed hands and large feet, and they develop a symbiotic relationship with a dermatological microbe that helps store oxygen and prolong the time they can spend underwater, while also turning their entire skin purple. They are all female, and must also use their technology for reproduction. Sharer women are considered adults when they take a “selfname”, which is supposed to represent their own worst trait – “the impatient”, “the inconsiderate”, “the lazy”, and they are then encouraged to spend their adult lives disowning that name. Reinforcing their alien-ness, to the Valans if not to the audience, is a completely different outlook on life and society, based on the concept of (you guessed it) Sharing. This approach borders on silly at times, and I was unconvinced by the linguistic representation in particular; we are told, in the language, that there is no distinction between subject and object for verbs, so “dog eats bone” and “bone eats dog” are literally the same sentence, represented on the page by “the dog shares eating with the bone”. Slonczewski illustrates this by having Merwen, one of the major Sharer characters, mysteriously say “oh, but does not the bone eat the dog?” a few times, except with examples picked to be a bit more convincing. This linguistic element is by the far the most prominent weak link in the otherwise excellent worldbuilding. Hope for the Future: On a community level, yes. Despite trials and losses (of which the greatest may be… their innocence…) the Sharers manage to overcome the Valan invasion through a combination of non-violent resistance, quiet reasoning and good old fashioned winding people up. The galactic patriarch hanging in the background adds useful short-term constraints on Valan behaviour: they can’t commit genocide against the Sharers, because genocidal technology is a power which can only be employed by the patriarch, and he won’t hesitate to use it against them next time he is in town – such is the balance of power when masculinity is on the line. However, it also leaves a cloud over proceedings at the end, with Sharer society safe from Valedon but perhaps not from the return of an overwhelming and unreasonable masculine force. A Door Into Ocean is pretty gender essentialist, and the biological engineering of the Sharers means it also embraces eugenics, at least in terms of physical adaptation to Shora's environment. In its defence, the plot does try to contextualise this somewhat: yes, the Sharers are an idealised version of a "feminine" society, but the explanation is not because they’re all female – rather their extreme living environment in the best way they can requires utter adherence to a cooperative, communistic way of life. Sharers still make difficult choices, fall in love, fall out of love, deal with criminals using a dismal understanding of mental healthcare (not that idealised after all...), and fail to live in close proximity to their annoying mothers. But they don’t have more than isolated incidents of murder or violence and or stratification within society, because their society is too precarious to allow those things, and their grasp of technology allows them to still make those precarious lives comfortable and well-connected in a way which doesn’t map onto any human society that I’m aware of. The conflict with Valedon pushes them into more difficult internal debate, particularly regarding the development and use of biological weapons which would be well within their capacity, but the justifications for using these are very different to the usual rationale for inflicting violence on an enemy. On the other side, the Valans and their different factions are a little more broadly painted and generally ended up blending together for me, although I was pleased that most of the military units were depicted as having women at all levels below the very top, and one of those women in particular is very much an ally to patriarchy and instrumental in keeping the conflict going, reinforcing the idea that we are watching a clash of societies and not some narrow, patriarchy-dependent Battle of the Sexes. The two POV Valans blend well in that mix, and it’s telling that of these two, it’s Spinel who ultimately takes the teachings of Shora to heart, though not by completely rejecting the things he’s learned from his own upbringing. Spinel starts off extremely uncertain and closed off to the Sharers, having been brought unwillingly to the planet to satisfy his parents. However, his experiences on Shora, and a brief return to Valedon, allow him to re-evaluate his own identity and the ways in which one can derive meaning and status in a community. Of course, there’s also an inevitable romance with Lystra. I can’t say the book needed this romance specifically, but their overall relationship is useful for providing an in-universe answer to the “is The Other human?” question which plagues the characters on both sides for most of the book. Legacy: A Door Into Ocean was published in 1986, the same year as Pamela Sergeant's The Shore of Women and two years before Sheri S. Tepper's The Gate to Women's Country. 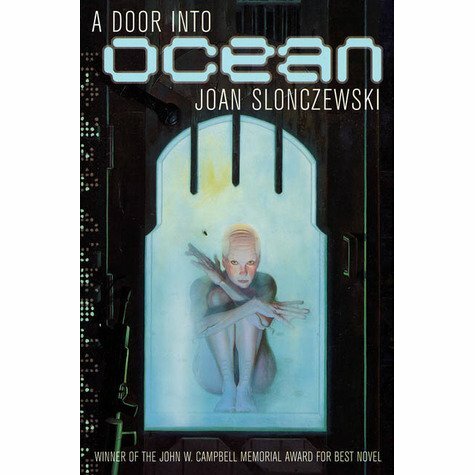 It won the John W. Campbell Award for Best Science Fiction Novel (not to be confused with the John W. Campbell award given to best new writers), making Slonczewski the first woman to win the award. Despite this, A Door Into Ocean doesn't seem to have maintained the same level of cultural relevance as other titles in its subgenre, which is a shame because I think it's actually one of the best of the bunch. Slonczewski's biology-driven science fiction puts me in mind of authors like Julie E. Czerneda, who also incorporates a lot of biological science into her books, and A Door Into Ocean also deserves a place among the canon of speculative fiction which makes use of "hard" science beyond the manly domain of astrophysics where too many conversations about hard science fiction still start and end. In Retrospect: It’s ultimately hard for me to separate my enjoyment of this book out from the fact it ticks a lot of my personal boxes: ocean planet, brilliant interactions between women, and a set of political tensions that has an interesting, complex conclusion. I also feel it avoids some of the missteps that make some of its contemporaries make. There’s a lot here to enjoy even for a less partial reader, both in terms of the worldbuilding and technology, as well as in its approach to conflict. If you’re not sure whether you like novels about planets of women taking on the patriarchy, you could do a lot worse than to start here — despite its more essentialist moments.